A silky-textured fresh goat cheese from Murcia Spain, this flavorful cheese is high in fat and protein with an amazing creaminess. Molded into snow white logs of silky cheese that's only slightly more solid than chevre, Capricho gives a burst of flavor with a sweet finish. 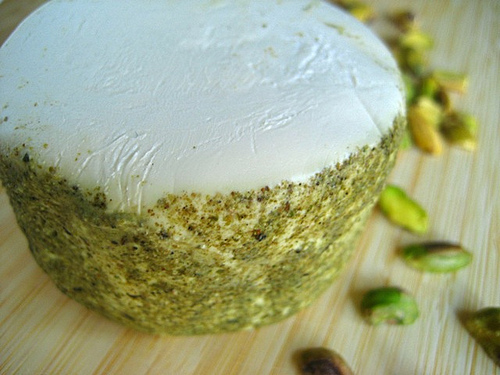 The verdant, pistachio hue is attributed to crushed green peppercorns. Green peppercorns are immature berries of black pepper that have been picked early and cured so they can retain their flavor and color. Often used for fish and poultry they give this cheese a piquant, almost arugula-like aroma that swirls in with the faint, goaty musk, creating an overall bright and green scent. Spicy flavor is balanced perfectly with the delicate texture of this cheese, making it astonishingly addictive. Spread on toast, or crumble atop a beet and arugula salad. Cut into rounds, coat with bread crumbs and bake. Warmed in an oiled ramekin, it is irresistible.